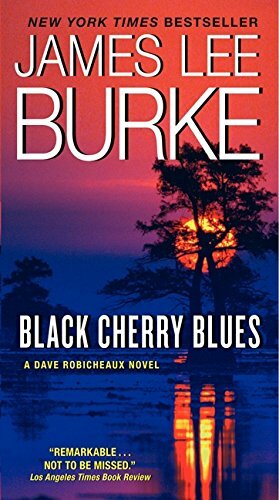 Here are my book notes for Black Cherry Blues by James Lee Burke. 4/5 stars. Lightweight but entertaining. Mostly succeeds at what it sets out to do, except when it comes to the female characters. Started the book on Jan 13 2019. Completed on Jan 25 2019. Averaged 24 pages a day. I read the Kindle version, on my Kindle Oasis. Beware of spoilers, which are not marked. Solid but lightweight Robicheaux southern gothic mystery yarn. After the crushing melodrama of the first two novels (note: I'm not complaining here, that thick, juicy southern gothic melodrama is one of the main reasons I read the series), the lightweight nature of the book is a nice change-of-pace; especially since we're settling in for a 20+ book series here. The mystery and plot of this one was a lot more clear-cut than the first two, whose plots were chock-full of ambiguous twists and turns and characters with murky motives. In retrospect, I think I prefer the moody, melodramatic murkiness of the first two (the True Detective TV series strikes a similar tone), but again the breeziness is a nice break after the intensity of the first two. I’m docking an entire star for the embarrassingly paper-thin female characters, whose portrayal in the series this far is borderline misogynist. Now, those are strong words, so I should clarify that I don't sense any intention of this kind of animosity from the author; in fact, quite the opposite, I sense a genuine warmth and affection for his doomed cardboard damsels, which makes me think that maybe James Lee Burke should stick to writing male characters? I mean, look at the evidence: Annie was alright, nice and smart and with a fierce streak, until she got, uh, [ S P O I L E R ] stuffed into the fridge [ / S P O I L E R ]. Robin — do I need to say anything about Robin, the whore with a heart of gold that Dave turns to in the second half of book 2 (intense shudder)? Darlene was hardly a character, and I’m still confused if Tess Regan was intended to be a love interest or even a character to be honest. Hopefully this is an aspect of the series that will improve as we go. Share book reviews and ratings with PJ, and even join a book club on Goodreads. PJ has read 0 books toward his goal of 30 books.